According to the National Solar Jobs Census 2011, 1 in 4 solar jobs in the United States is held by a Californian. The report was released on October 17th by the Washington-based Solar Foundation, and revealed significant growth in the solar industry countrywide, with California leading the way. According to the Solar Jobs Census, employment in all areas of the solar industry grew 6.8% in a 12 month period ending in August. Included in that growth were jobs in manufacturing, installation, residential, commercial and large-scale power generation. In comparison, job growth in the United States measured in at less than 1% over that same time period, suggesting that the burgeoning solar industry may grow faster than the US economy in the coming years. And with the bankruptcy of solar manufacturing giant Solyndra still fresh on people’s minds, the recent growth numbers indicate that the solar industry has momentum and is still a worthy sector for investment capital. Meanwhile, this is great news for California, which is establishing itself as a green-powerhouse in the US. The Golden State currently leads the way in photovoltaic and concentrating-solar electricity generation, and is engaged in many other initiatives to solidify its green growth. The state has plans for a cap-and-trade program and Californians are generally strong supporters of environmental policies. What are your thoughts on the recent number from the National Solar Jobs Census? Do you think this growth will continue into the future? 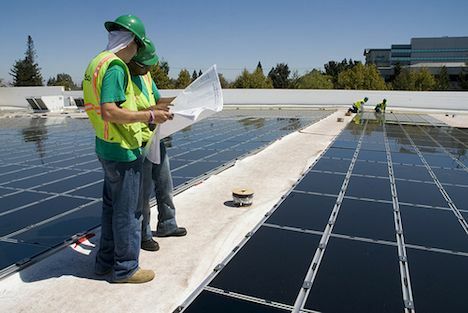 Image CC licensed by Walmart Stores: Solar installation at Mountain View, California store.